Secure Sockets Layer (SSL) (and its successor Transport Layer Security (TLS)) is an encryption protocol that is designed to protect the privacy and security of sensitive communications across a network, such as the Internet. The use of SSL encryption is rapidly increasing. In 2017, approximately 50% of web traffic was secured by the protocol and this is expected to rise to 80% by 2019 according to Gartner. Currently most major websites including Google, Facebook and Wikipedia, enforce encryption and are using SSL across their sites (HTTPS sites). 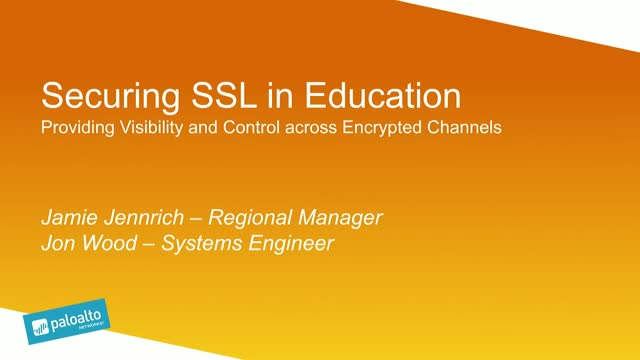 Join Jamie Jennrich, Regional Manager for Education and Jon Wood, Systems Engineer at Palo Alto Networks for an exclusive Cybersecurity Webinar ‘Solving the challenges of SSL decryption in Education’ on May 24th at 3.30 p.m. (BST) During this event they will discuss the difficult tension in education today between allowing students and staff easy and open access to information while ensuring their working environment is secure and safe, protected from growing cyber threats.